The TiVo Slide Remote is officially available for sale today, for $89, and will hit Best Buy stores this weekend but TiVo was nice enough to send us one a bit early so we could play. The Slide is considerably shorter than the TiVo Peanut we've come to love, but at the same thickness it slides out to reveal a full QWERTY keyboard. It's actually a full Bluetooth remote, so even if the keyboard doesn't interest you, the remote's ability to work without a line of sight to the TiVo might draw you in. And of course we just had to plug the included dongle into a PC to see what happens -- no the TiVo Premiere doesn't have Bluetooth built-in -- but for those results and more you'll have to click through. How would you rate the Slide? 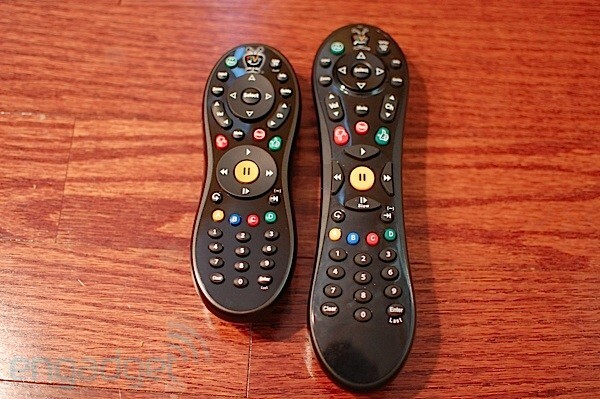 Some hate it, but most love it, TiVo's peanut remote was one of the first remotes that showed how much more there was to a remote's design than just which buttons you included and how it looks. The TiVo Slide Remote shares many of the same design aspects from the shape, tactile feel on the bottom, and button layout. The layout is a little different from the TiVo Premiere's though as the transport controls aren't discrete buttons and are instead on a circle like the d-pad. This might've been done to save space on the smaller remote, but no matter, we prefer the discrete buttons. It isn't as annoying as the fact that the pause button fell off when we accidentally dropped it on a tile floor from waist height, though. Overall the smaller peanut feels right at home and while the side action can be performed easily with one hand, it isn't without the accidental button press. The slide action does feel good and solid and the keyboard is easy to get used to. We really like how TiVo added another d-pad and number pad on either side of the keyboard, but wish there was a search button under there as well (the TiVo+4 search shortcut doesn't seem to work on the TiVo Premiere). We were happy to see that the entire remote is Bluetooth, and also includes an IR emitter so you can program the TV power and volume buttons (another function that works identical to the typical TiVo remote). The glow features works exactly like you'd expect and makes it much easier to find the main buttons or keyboard keys in a dark room. One omission is a rechargeable battery, instead it uses a pair of AAs like most TV remotes. The only way TiVo could've made the setup of the Slide Remote any easier is if Bluetooth was included in the TiVo Premiere, seriously after you plug in the dongle, it just works. Programming the TV power and volume buttons was easy with help from the on screen guide. At the price you might expect the ability to do macros, but you'll be disappointed as aside from the keyboard and the Bluetooth part, the functionality is identical to the typical TiVo remote. We already mentioned that the Slide performs almost exactly like the traditional TiVo Peanut and other than the lack of search button next to the keyboard, we like it. The 14.6 software update accompanies the Slide Remote, but other than the added ability to support the Slide, we didn't notice anything new (so it isn't all of a sudden speedy or anything). It seems that there is some room for improvement on the software side though. For example, when we were searching for our brand AVR to program the volume buttons, hitting the P button on the keyboard took us much closer to Pioneer than scrolling down, but while viewing My Shows, hitting the H button didn't take us any closer to HD Nation and we had to result to scrolling. So while we're sure TiVo had to at least add the Bluetooth dongle driver in this build, it doesn't appear that much else was optimized for the Slide. 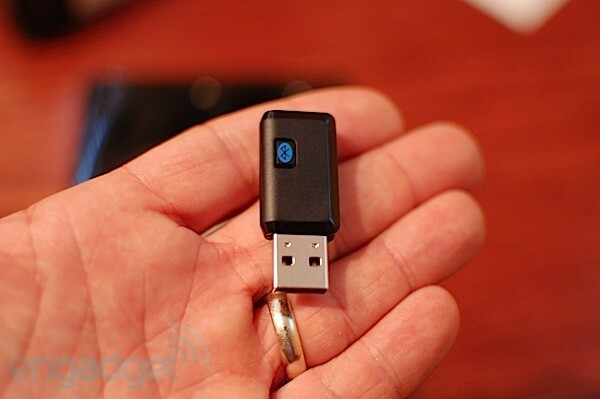 You won't be surprised to learn that we plugged the Bluetooth dongle into our PC just to see what happens, and as you might expect after learning the TiVo Premiere supports USB keyboards, the TiVo Slide Remote works just fine on a PC. We also paired it with our laptop and it showed up like any other Bluetooth keyboard. The keyboard, number pad, transport controls, and d-pad buttons do exactly what you'd expect, but the rest of the keys are more of a mystery. Out of the box it won't be terribly useful to HTPC fans since the TiVo button equates to F1 etc, but with a little help from an application like Intelliremote, you could easily remap the keys and use the TiVo Slide Remote as a full on Media Center remote. The $89 price seems to sting a bit at first but when you consider that the TiVo Glow Remote sells for $49 and other living room Bluetooth keyboards, like the diNovo Mini, go for closer to $149 the price seems pretty reasonable. And unlike the other wireless keyboards, this one will also perform as a regular TiVo remote. So in appreciation for one device that does two things pretty well we have to give our approval to the TiVo Slide Remote. It isn't everything we want in a remote control, and isn't perfect, but if you've always found keying in searches on your TiVo tedious and have $89 laying around, you have yourself a new gadget. ALVISO, Calif. – August 24, 2010 - TiVo Inc. (NASDAQ: TIVO), a leader in advanced television services, including digital video recorders (DVRs), today announced the availability of the TiVo® Slide Remote with an easy to use, slide-out, QWERTY keyboard. The TiVo Slide provides users a richer TiVo experience through the delivery of progressive search in the television, making it easier to find your favorite series or celebrity on TV, YouTube, Netflix, Rhapsody and more. "This finger-friendly device strengthens TiVo's product offerings, giving consumers the best tools to find what they want more quickly," said Jim Denney, vice president and general manager of product marketing for TiVo. "This is the first ever DVR remote with a full QWERTY keyboard, and we are certain that users will be excited to get their thumbs on it. The slick design has the same fun look of the classic TiVo remote, but makes it even easier to get more from your TV experience." TiVo was the first to deliver progressive media search and now with its new slide-out QWERTY keyboard, the TiVo Slide Remote allows consumers quickly and easily find the latest and most relevant entertainment – whether that be via YouTube, Amazon Video On Demand, Netflix and more – all in one place, and all with one box. The TiVo Slide Remote is an all-in-one remote control for the all-in-one entertainment box. Its Bluetooth technology increases the remote's reliability, and range up to 30 feet away. Its sleek, peanut shaped design is fully backlit, and includes power and volume controls for the TV. And installation is fast with easy plug n' play functionality. Just plug the USB receiver into the port on the TiVo box, and play. To celebrate its availability, TiVo is giving away one TiVo Slide Remote control each day for 30 days! To enter the 30 Slides in 30 Days Sweepstakes, people must first become a fan of TiVo on Facebook or follow TiVo on Twitter. Fans and followers can then enter the giveaway for one of the thumbtastic prizes at www.tivo.com/30slides. We additionally encourage fans and followers to respond with the name of a favorite TV show, movie or web video – which they will be able to search for oh so much faster with the TiVo Slide. TiVo Slide is available today at tivo.com for $89.99 and coming this weekend at Best Buy stores nationwide. The new remote will work with TiVo Premiere and Premiere XL units, TiVo Series3, TiVo HD, and TiVo HD XL.